California’s court system has borne a disproportionate share of the state’s budget hardship – denying vital services and preventing many Californians from ever having their day in court. In order to provide Californians with an avenue for redress for their wrongs, our courts must be adequately funded. California’s court system has borne a disproportionate share of the state’s budget hardship, denying vital services and preventing many Californians from ever having their day in court. Because the court system receives its funding from the state Legislature, justice is often at the mercy of the budget process. Today in California, our courts are being put at risk. In the aftermath of the Great Recession of 2008-09, the California Court system faced a 30% reduction in its general funding. Budget cuts closed hundreds of courtrooms and courthouses throughout the state and drastically scaled back court services in every county. Judicial backlogs from court closures and furloughs mean that all Californians have longer waits and less access to justice. More than $1.1 billion was cut from the judicial branch budget after the start of the Great Recession in 2008, with severe impacts on court services for businesses and consumers alike. More recent state budgets have helped restore some of the funding, including an additional $258 million for trial courts in 2018-19, but much more remains to be done. Judicial cutbacks affect everyone, but especially the most vulnerable Californians. More often than not the Court System is forced to balance its budget on the backs of the most vulnerable members of society. Budget cuts often close special court programs that deal with juvenile dependency, indigent defendants, drug addiction, veterans and victims of domestic violence. These vulnerable groups already face substantial barriers getting into court, and court funding cuts makes it even more difficult to seek justice. 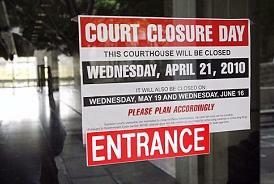 Closed courtrooms strain other government services, which are forced to absorb the needs of those waiting for justice. Long lines and crowded court dockets keep children in foster care and keep victims of domestic violence in abusive situations or shelters. The shortage of judicial resources ensures that many people will be unable to seek justice at all, and those who do will have a difficult time navigating a slower system. Closed courtrooms slow justice and frustrate California’s economy. Shortsighted budget solutions that harm the courts make it difficult for California to maintain a robust economy. Courtroom closures do not just cost court employee jobs; they also wreak havoc on California’s business climate. With wait times in civil cases reaching six months for a hearing, a simple business dispute can create years of uncertainty for California business owners.